The route from my house to Gloucester is fast becoming ingrained in my mind, as I made the trip for the third time this week in order to participate in the Great Annual Fish Count, hosted by the New England Aquarium Dive Club and the Reef Environmental Education Foundation (REEF). 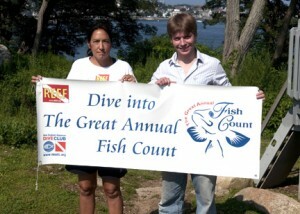 My destination for the day was Stage Fort Park, where I met up with Holly Bourbon, a former Senior Aquarist at the NEAq and current Biologist and Dive Safety Officer at the MA Department of Marine Fisheries. We suited up to do our survey at one of the park’s beaches; given the rain of the past few days we weren’t expecting much in terms of visibility, but once we got a bit off shore the water cleared up to about 15′ or so of vis, enough to get some decent fish ID in. As I dove, I compared this fish count to the numerous surveys I conducted in Panama; though the objectives were the same in both cases, it was clear that doing research up here, in cold, murky water, required a distinctly different skill set and approach that that of working in tropical conditions. Though my powers of observation paled in comparison to Holly’s, I managed to spot a few well-camouflaged sculpins, as well as a number of small winter skates, a couple of lobsters, and countless hermit crabs. My DUI drysuit came in handy again today as the male members of the Frank Scalli Interns — Rick Simon, Ryan Hunter, and myself — met up at Cape Ann Divers to dive one of the most popular Gloucester wrecks, the Chester Polling. We were the only divers that day, so we had the entire 45-ft charter boat to ourselves; more importantly the weather and water were perfect, with minimal swells and no current, and once we got down to the stern we were treated to 30ft visibility, ideal conditions for this dive. On our first dive, Rick showed me around the base of the hull and into the massive hole where the bow sheared off from the stern section. After lunch, I took the videocamera down to the deck of the Polling and recorded the diverse organisms that reside there, ranging from baby seastars to anemones to schools of red snappers. A good set of easy, interesting dives; I can see why the Polling is so popular, as I certainly intend to return sometime and explore it further. After a short break in the internship, I set off to Salem to work with Dr. Joe Buttner at the Cat Cove Marine Laboratory. 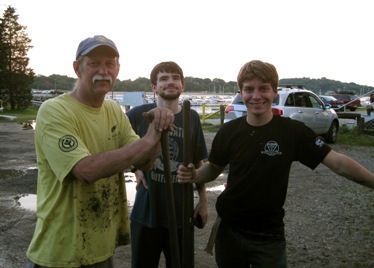 Dr. Joe and Salem State College have been working with the Massachusetts Department of Marine Fisheries since 2006 to study methods to restore softshell clam (Mya arenaria) populations in the Boston Harbor and surrounding area. Upon arrival, a lab assistant showed me around the Cat Cove lab, where millions of softshells are raised from birth–when they are roughly the size of a grain of rice–until they are large enough (>10mm) to be seeded in the intertidal zone of nearby beaches. Dr. Joe explained how clams in these seeded plots not only reach maturity and full size quicker than normal but also attract softshells already in the ecosystem, further increasing the population density and reproductive rates at the seeded beaches. After touring the facility and going over the data collected so far in this program, I grabbed shovels, waders, buckets, and a pair of waterproof boots and hopped in a truck with Dr. Joe and three of his assistants to ride out to Quincy. We planned to sample softshell sizes from a series of plots seeded the year before, and were racing to take advantage of the low tide. Once we made it to the beach I witnessed an impressive phenomenon; though the change at low tide was only expected to be -5 ft, the extremely flat profile of the beach we were at meant that, at low tide, almost a quarter-mile of the intertidal zone was exposed! When we arrived only a corner of the nearest plot was visible, but within minutes the first line of plots, which measured 12ft x 50ft, were completely exposed; I could actually watch the waterline visibly recede after each wave passed by. Of course, what goes out must come back in, so we set to work immediately to try and sample all the plots before the tide turned and came rushing back in. At each plot, we randomly selected 3 one-square-foot samples to dig out; the mud from each was then carefully sifted out in a nearby outlet of water, and any live clams were counted and measured. The first plot yielded only one clam, but we struck gold on the next few plots, pulling out 20+ clams in each sqft sample. These clams varied in size from 30mm to 70mm, and we even managed to find a few live razor clams among all the softshells. Despite starting an hour and a half before low tide, we barely had time to gather samples from half of the plots before the water poured back in and threatened to wash away all our equipment. We returned to the truck as the sun set on a day of hard, dirty, but thoroughly satisfying work; the life of a Marine Biologist might not be glamorous, but I think the grin on my face was evidence enough that it can be quite enjoyable. After lunch, I once again donned my Scuba gear in preparation for the 1:15 maintenance dive. It struck me how, in just the two months or so that I’ve been diving with this gear, I’ve grown quite used to it; at the start I never thought I’d want to give up my old BC, regulator, and dive computer (all of which I love so dearly,) but after over 30 dives in this gear I’m beginning to doubt I’ll go back. All the dive equipment that Bob Boyle (of Undersea Divers) donated has worked excellently for me, and for that I am very thankful. 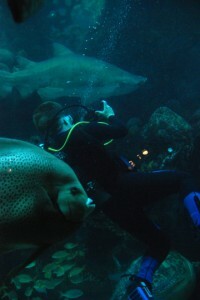 But I digress–back to the Aquarium, where I prepared to jump back into the GOT for one last dive with Myrtle, the Sand Tiger Sharks, and everything else that makes that exhibit so unique and entertaining to experience. My dive buddy for the day was the assistant aquarist Dan Dolan, continuing the streak of dive buddies at the NEAq with the exact (or very similar) first name as mine. Dan was more than willing to get some footage of me in action, filming video while my family–who had arrived minutes earlier–shot still photos and waved excitedly through the glass. Apparently a number of the visitors remarked to my mother about that “brave young man diving in there with all those ferocious sharks,” comments that I’m sure made her very proud (and amused me to no end. 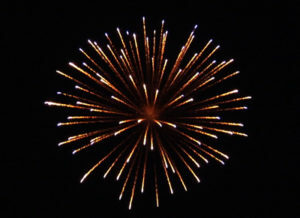 Though I felt pretty good about them too.) I certainly didn’t want to leave the tank, and Dan was nice enough to let me linger a number of minutes past the planned run-time to wave to the visitors, film extreme closeups of the sharks passing at barely arms-length away, and scratch Myrtle’s back a few more times for good measure, but too soon it was time to surface again. I may never get a chance to dive in the GOT again, but the memories I have (to go along with the amazing footage I took) will always remain with me. Speaking of amazing footage, after de-robing from my gear and wetsuit I had to race back downstairs, camera in hand, in time to jump into yet another wetsuit (of the much thicker 7mm variety) and help out with the afternoon feeding session in the Penguin exhibit. I had the opportunity to feed the Little Blues again, and this time I managed to avoid getting quite as many scratches on my fingers. However, the little penguins were still quite a handful to deal with. A number of them were entering into their yearly molt and, as such, were gorging themselves on fish; one little guy in particular kept bullying the other penguins out of the way (a behavior we don’t encourage nor reinforce,) and it took quite a bit of dexterity and patience to get each fish to the proper penguins without him snatching it out of my hand (or their beaks.) However, I still managed to get everyone fed, and after that I took the camera, still in its Gates housing, to get some underwater footage of the African penguins. I managed to get some great shots of the birds gracefully diving into the water and swimming by, while some of the more curious ones swam up to (and pecked at) their reflection in the dome of the housing, netting me some excellent close up footage. Feelings were again bittersweet as I left the exhibit, uncertain if I’d ever get to be in such close proximity with such interesting creatures ever again; but then again, the Aquarium is always looking for capable volunteers, and who knows–maybe next year will find me back on exhibit at the NEAq as a summer volunteer, intern or even co-op (a college credit program offered in many of the departments at the Aquarium.) 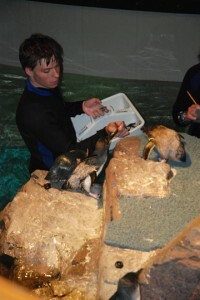 I certainly had an amazing time in my week spent at the New England Aquarium; I owe a lot of thanks to the phenomenal staff and volunteers I worked with, who can somehow take the mundane acts of thawing fish, chopping up squid, scrubbing guano, and more and turn them into fun, unforgettable experiences. Back in the Penguin exhibit today, and while much of the day’s work mirrored that of Tuesday’s, two very cool things happened. First, Paul Leonard tasked me with feeding the Little Blue penguins. Little Blues, also known as Fairy penguins, are the smallest species of penguins–many visitors to the aquarium mistake them for juveniles–and also happen to be my favorite, so I was very excited to get to work so closely with them. Feeding penguins can be a bit tricky, as you have to put the fish directly into the bird’s mouth before they’ll grab and eat them. This leads to a delicate balancing act, as one must push the fish far enough that they’ll grab on, but not so far that they’ll grab onto one’s fingers. After a few minor bites, I got the hand of things, and managed to get everyone fed and learn to identify a few more birds in the process. Once feeding was done, everyone jumped straight into cleaning the exhibit, with even more vigor than usual. You see, we’d just found out that morning that Jeff Corwin, of Animal Planet fame, was at the aquarium to shoot a PSA on global warming, and would be in the penguin tank at 11AM sharp to film with the Africans. This didn’t leave us much time to clean up after the morning feed, so we had to work extra hard to get everything looking pristine for the cameras. I had the privilege of staying in the tank while Mr. Corwin was being filmed, and used to opportunity to take some notes on how a nature documentary crew goes about their work. It was great to see Jeff speaking from his heart, rather than using a script, and the penguins sure loved him; Possession, an male African who had taken a shine to following me around the entire tank, climbed up next to Jeff and nuzzled his leg during the entire shoot, while Plum Pudding and In-guza, a breeding pair, took the opportunity to get a bit…intimate right next to him, resulting in a lot of laughs from everyone involved. After the filming was done, Jeff toured the rest of the tank and then heading off to get some footage with the fur seals, while we all fell back into the same routine; celebrities may come and go, but the animals are always there, and they are always hungry! Down we went on the line, unsure of what the conditions would be like when we reached the wreck. 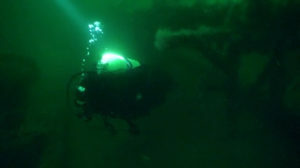 The Mary Alice lies in 92ft of water and often visibility is poor; as well, there can be a strong current on the seafloor, much like what I’d experienced diving the Regina. However, as we dropped down deeper and deeper, we found some of the best conditions possible, with no current whatsoever and 50′+ visibility–enough to see clearly from the bow to the stern of the sunken tug resting upright and pristine on the lakebed. The wreck is in such great condition that I was able to enter the wheelhouse, spin the wheel back and forth a couple of times, then go around to the galley, open the door (which peeled open without any resistance) hover over the kitchen sink, perfectly intact. After surfacing into now 2-3′ white-tipped swells, we decided not to attempt a second dive, and instead end the trip on that successful note. 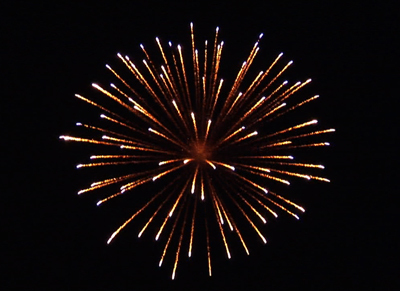 That evening, Jim and Pat regaled me with stories of conducting the first ever dive on that wreck–Jim found intact dishes still waiting to be washed in that galley sink–and we headed into town to film (and enjoy) the local fireworks display. All in all, a great end to a great trip, and another successful stage completed on this amazing internship. Next up–working with penguins and diving with sharks at the New England Aquarium! The storm finally left us overnight, and Jim and Pat Stayer were quick to jump on the opportunity to get some wreck dives in. We loaded up gear into their boat–including cameras to film both topside and underwater–and sped off to the first dive of the day, a 56′ tugboat named the Sport. This boat is famous for being the first tug built with steel to cruise the Great Lakes; despite sinking in 1920 she remains in excellent condition, with an intact hull and easily visible boiler, prop, and steering wheel. The first thing I noticed when descending the Sport, however, was how quickly I sank to the bottom; turns out I’d forgotten to adjust my weights for freshwater diving, and was a good 5 lbs heavy. This caused some buoyancy issues while filming, but I still managed to get some great footage of the wreck and the countless gobies swarming over it. After diving the Sport, we heading back inshore to dive a shallow wreck located less than a mile off the harbor–the Eliza Strong. 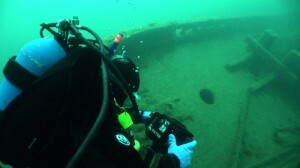 This 200′ wreck is in a bit more disrepair than the Sport; it seems that, not too long after sinking 1901, the Army Corp of Engineers decided to “flatten” the Strong with over half a ton of dynamite so that there would be at least 20′ of clearance over the ship. What remains are long lengths of deck boards, lots of scrap metal (including a number of large, hand-forged nails,) and countless fish seeking refuge in the scattered ruins. This time, with my weight corrected, I glided effortlessly around the wreck, capturing good footage of the debris (despite the runoff from the recent storm, visibility was at least 25′) and even discovering a sizable channel catfish hidden among the planks. On both dives, my new DUI drysuit continued to do its job perfectly; despite the water temperature being a good 30 degrees lower than Panama, I never felt cold at all. After a weekend’s respite, I returned to the action again, this time at Lake Huron, where a surprisingly tenacious storm has blown out our chances to dive for the past two days. Fortunately, the extra time on land allowed me to catch up on logging and capturing all the footage I took in Panama. Pat and Jim Stayer, my gracious hosts (and excellent cinematographers) gave a number of tips for recording and managing all the footage I’m accumulating this summer, as well as some invaluable tips for underwater color correction (though the Sony HC3 captures beautiful detail in hi-def video, it’s auto-white balance leaves something to be desired.) My editing workload will be a lot more manageable–and less stressful!–thanks to their input and advice. And it couldn’t come at a better time, as the next few days promise to rack up the footage as the three of us head out to film some freshwater wrecks. Another deep dive today, to 120′ this time. Now that we had been exposed to some of the challenges of deep diving, we were given a more specific assignment, to document distribution of various marine species at depth. This time around, everyone was prepared for narcosis at depth, no matter how subtle, and as a result our dive went a lot smoother. Even though two divers experienced significant, noticeable narcosis, everyone performed their checks properly and recorded usable data at depth; the only “victim” was one diver who, lured by Terrence gesturing at something at the seafloor, hit 128′ before she realized what he was up to. But for that, the dive went quite smoothly, and we were rewarded with the spotting of a large hogfish at 110′–the first decent sized game fish we’ve seen this trip–as well as a pair of squid hovering over the reef at 30′ that pulsed various shades of blue as we drifted by. The rest of the day was spent relaxing onshore, but as the sun started to set we cast off again, heading back towards Portobelo Harbor for a night dive at the San Marinas reef. Though lighting difficulties limited the quality of the footage I could capture on that dive, it was still very enjoyable to cruise around the reef wall at 60′, observing the bioluminescence, various crustaceans, and (finally) a definite glimpse of an adult octopus, who was unfortuantely securely buried in a rock face so that only his tentacles protruded out in sight. Tomorrow will bring us our final dive, which promises to test our experience and take us to the recreational depth limit of 130′. These past few dives have been a great capstone to all the learning and fun we’ve had on this trip; Panama will sorely be missed, though I can’t wait to see what’s next to come in this incredible internship.